As expected, New Line's Conjuring spin-off dubbed Annabelle Creation took the top spot at the box office this weekend with $35 million. The low-budget spin-off has already doubled its $15 million budget, and it's potentially shaping up to be one of the most profitable movies this year. Other newcomers The Glass Castle and The Nut Job 2: Nutty by Nature both underperformed, leading to weak opening box office numbers. Box Office Mojo reports that Annabelle: Creation debuted in 3,502 theaters, for an impressive $10,006 per-screen average, with The Nut Job 2: Nutty By Nature debuting in third place with $8.9 million, with a meager $2,232 per-screen average from 4,003 theaters, behind Dunkirk in second palace with $11.4 million. The Glass Castle opened in ninth place with $4.8 million, earning a $3,337 per-screen average from 1,461 theaters. Annabelle: Creation, a spin-off of The Conjuring, came just shy of its predecessor, 2014's Annabelle, which debuted with $37.1 million, with a grand total of $256.8 million ($84.2 million domestic, $172.6 million internationally). The film was produced under a $6.5 million budget. The first Annabelle movie did not fare well with the nation's critics, with just a 29% rating from the critics on Rotten Tomatoes, but this new movie, Annabelle: Creation, a prequel to the orginal, turned things around in a huge way, scoring a rare 100% rating on Rotten Tomatoes after the first wave of reviews poured in. The movie currently has an 83% Fresh rating, dropping off slightly from the first wave of reviews, but it is still a massive improveent from the original movie. 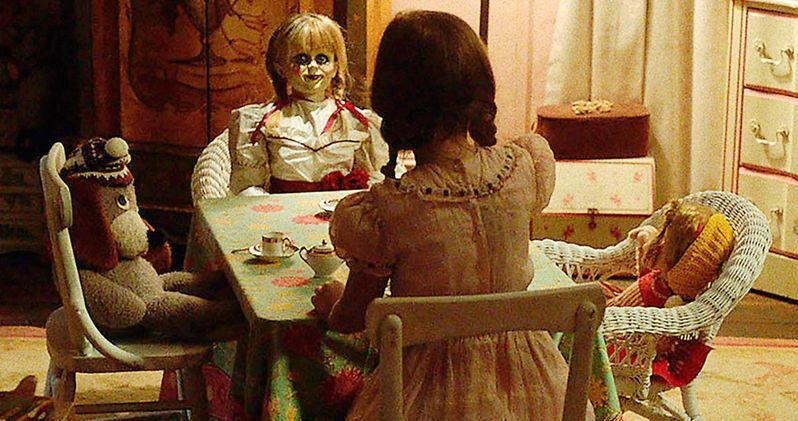 Annabelle: Creation also had the benefit of opening in more theaters, with a 3,400-theater rollout, slightly more than the first Annabelle, which opened in 3,185 theaters. Related: Can Annabelle 2 Topple Dark Tower at the Box Office This Weekend? Annabelle: Creation follows a doll maker and his wife, who welcome a nun and several girls from a shuttered orphanage into their home, several years after the tragic death of their little girl. They soon become the target of the doll maker's possessed creation, Annabelle. David F. Sandberg (Lights Out) directs from a screenplay by Gary Dauberman, who also wrote the first Annabelle movie. The film stars Stephanie Sigman (Spectre), Talitha Bateman (The 5th Wave), Lulu Wilson (Ouija 2, Deliver Us from Evil), Philippa Coulthard (After the Dark), Grace Fulton (Badland), Lou Lou Safran (The Choice), Samara Lee (Foxcatcher, The Last Witch Hunter), and Tayler Buck in her feature film debut, with Anthony LaPaglia (TV's Without a Trace) and Miranda Otto (Showtime's Homeland, The Lord of the Rings Trilogy). The top 5 is rounded out by Dunkirk} ($11.4 million), The Nut Job 2: Nutty by Nature ($8.9 million),The Dark Tower ($6.8 million) and The Emoji Movie ($6.6 million). The Nut Job 2: Nutty by Nature brings Surly Squirrel (Will Arnett) and his whole gang back for another adventure. We are once again in Oakton where the evil mayor has decided to bulldoze Liberty Park and build a dangerous amusement park in its place. Surly and his ragtag group of animal friends band together to save their home, defeat the mayor, and take back the park. The Nut Job 2 also features the voice talent of Katherine Heigl (The Nut Job), Jackie Chan (Kung Fu Panda 3), Peter Stormare (Penguins of Madagascar), Bobby Cannavale (Ant-Man), Isabela Moner (Middle School: The Worst Years of My Life) and Maya Rudolph (The Angry Birds Movie). The top 10 is rounded out by Girls Trip ($6.5 million), Spider-Man: Homecoming ($6.1 million), Kidnap ($5.2 million), The Glass Castle ($4.8 million) and Atomic Blonde ($4.5 million). Also opening in limited release this weekend is A24's Good Time, which earned $137,625 from four theaters for a $34,406 per-screen average, Neon's Ingrid Goes West, which took in $141,216 from three theaters for a $47,072 per-screen average, Roadside Attractions' The Only Boy Living in New York, which earned $57,619 from 15 theaters for a $3,841 per-screen average, Freestyle Releasing's Bedeviled, Strand's The Nile Hilton Incident, Well Go USA's A Taxi Driver, which took in $332,000 from 41 theaters for a $8,098 per-screen average, Once Upon a Time, which took in $256,500 from 51 theaters for a $5,029 per-screen average and IFC's A Trip to Spain, which earned $45,306 from three theaters for a $15,102 per-screen average. No box office data was released for Magnolia's Whose Streets. There is no indication on whether any of these films will expand in the weeks to come or not. Looking ahead to next weekend, two new movies will arrive in wide release, Lionsgate's The Hitman's Bodyguard}, starring Ryan Reynolds and Samuel L. Jackson, along with Bleecker Street's Logan Lucky, starring Channing Tatum, Adam Driver and Daniel Craig. Also opening in limited release is Vertical Entertainment's action film 6 Days, Well Go USA's action-crime thriller The Adventurers, Samuel Goldwyn Films' drama Gook, Magnolia's comedy Lemon, Fox Searchlight's drama Patti Cake$ and Abramorama's documentary Sidemen: Long Road to Glory. Take a look at the top 10 estimates for the weekend of August 11, and check back Tuesday for next week's wave of predictions.